The Hop on Hop Off Drone tour is a great way to explore New York City to witness the awe-inspiring aerial views that exhibit this lively city. If you have ever wished what New York City looks like from a birds view, you will be delighted as you watch this drone video footage taken from a drone. Sometimes, the best way you can approach to explore the city’s truest self and inner beauty is to take a different stance and witness it far from above high up from the sky. It’s almost like flying in a magic carpet and buzzing past the city and hovering over and basking yourself in the city’s natural beauty. Clean flowing rivers, shining monuments in sunlight, aerial view of parks filled with greenery and majestic moments of city bridges–Nothing beats this awesome aerial tour of your New York City. It’s more like watching your favourite city in a different form altogether. 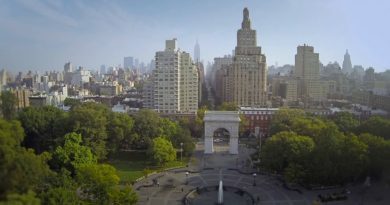 In this exclusive New York Drone video Footage, you get a glimpse of the Cityscape right from a Hop-On Hop-Off Drone Tour. One can see several shots of city’s tallest buildings slowly progressing towards wider shots for parks, monuments and lakes. The aerial panorama of New York City comes alive with bustling traffic as the camera moves in close quite a few times and makes a swift change in angles from above. The New York Hop-On Hop-Off Drone Tour is a fine way to capture the city’s high held spirit in a different light as the city of skyscrapers shines in its grandeur. Get a tour of NYC from a tour bus in the sky. The shots of the bridges, parks, and structures are magical. Especially with the Marley Remix. Keep rocking the footage Faizon. The Hop on Hop Off Drone tour is a great way to explore New York City as it imparts a feeling that one might get when they see this city for the very first time. The drone has captured the awe-inspiring aerial views that exhibit this lively city like never seen before. New York City is perhaps one of the finest destinations for testing and trying out drone tour photography and presenting it before one and all viewers. You Won’t Believe How Close This Drone Photographer is Getting to the Manhattan Skyscrapers! September 30, 2015 FreshSqueezed Comments Off on You Won’t Believe How Close This Drone Photographer is Getting to the Manhattan Skyscrapers!